FORT MYERS, Fla. — Brian Peltier says he started smoking when he was just 8 years old. “I did cigars, I did tobacco. I did snuff … I did dip,” Peltier said. But he quit seven years ago. He credits vaping. Peltier says he had a few health complications before giving up smoking, but he says now his doctors are proud of his health. “Cardiologists and all of that stuff has told me that my health has gotten a lot better compared to me smoking”, he told WFTX. Now the general manager of MotoVapor in Fort Myers, Florida, he says he’s helped a couple hundred other people transition from traditional smoking to e-cigarettes. 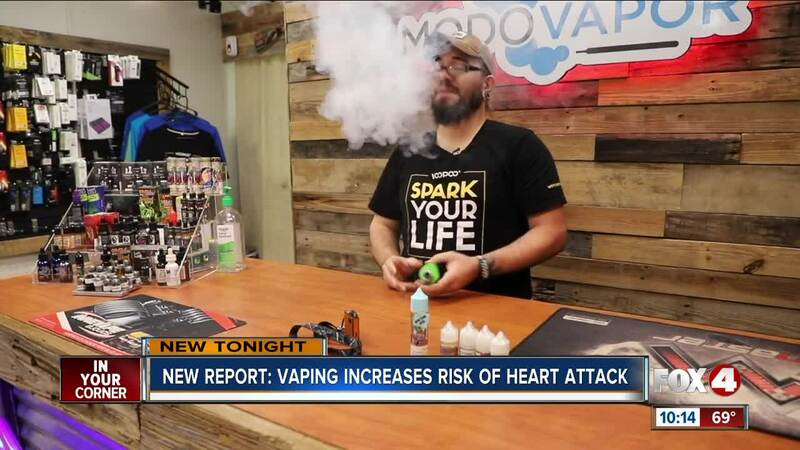 But, a new study by the American College of Cardiology says that vaping increases a risk of a heart attack by more than 50 percent. According to the study, it can also increase a person’s risk of stroke and depression, compared to those who don’t use tobacco products. WFTX spoke with Dr. Scott Allen, an interventional cardiologist at Florida Heart Associates in Fort Myers. He says studying the link between e-cigarettes and heart attacks is complicated. “It’s hard to tell. Did they have their heart attack because of the cigarettes that they were still smoking … or was it the e-cigarettes?”Allen said. These are some questions Allen says makes truly identifying a link challenging. Allen says nicotine itself doesn’t necessarily increase the risk of heart attack. He says he understands why people use e-cigarettes to quit smoking, but he advises a more longterm solution. “The goal should be for complete abstinence from both tobacco smoking, and e-cigarette use,” Allen said. Peltier says all of that is true. But, he says underlying conditions can be irritated without inhaling anything. “It (underlying diseases) can hit you another two to three years without you smoking or vaping,” Peltier argues. He agrees that the health risks matter. But, he says, so does the progress he’s seen in his customers — and in himself. “I would honestly prefer to do this than ever pick up cigarettes again,” Peltier says. Authors of the study say they want to be clear: Smoking traditional cigarettes presents a higher risk for heart attack. However, they find it important to share their findings with people who vape. The entire study will be presented at the American College of Cardiology's Scientific Session next week in New Orleans, Louisiana.